The Oakland Athletics continued to improve their bullpen today, signing left-handed reliever Jerry Blevins to a 1-year minor league deal, worth $1.5 million. Blevins is coming off perhaps his worst year in the Majors, but still has the ability to be a valuable arm in the bullpen. Blevins is heading back to a familiar place, as he spent the first seven seasons of his career in Oakland. He debuted in 2007, and was traded following the 2013 season. He was a big part of the A’s bullpen in their 2012 and ’13 playoff runs, and could repeat his role next season with another Oakland club looking to make a playoff run. Blevins was a workhorse for the A’s in those two seasons, and was a solid one too. In 2012, the southpaw went 5-1 with a 2.48 ERA, 1.07 WHIP, 0.96 HR/9, 4.21 FIP, 3.44 BB/9, and 84.4 LOB%. His advanced numbers weren’t great, and his 4.21 FIP suggests that his 2.48 ERA should’ve been higher. Blevins had constant traffic on the base paths in 2012, but was excellent at getting out of jams, as told by his very high LOB%. While Blevins had the better ERA in 2012, he was a better pitcher in 2013. Across 67 games, he went 5-0 with a 3.15 ERA, 1.07 WHIP, 2.55 BB/9, 3.88 FIP, and 77.3 LOB%. While having the same WHIP, his walk rate took a big drop, and so did his FIP. Even though he gave up more runs, his overall numbers suggest that 2013 was the better campaign for Jerry Blevins. 2014 was a disastrous season for Blevins, even though he statistically pitched very well. 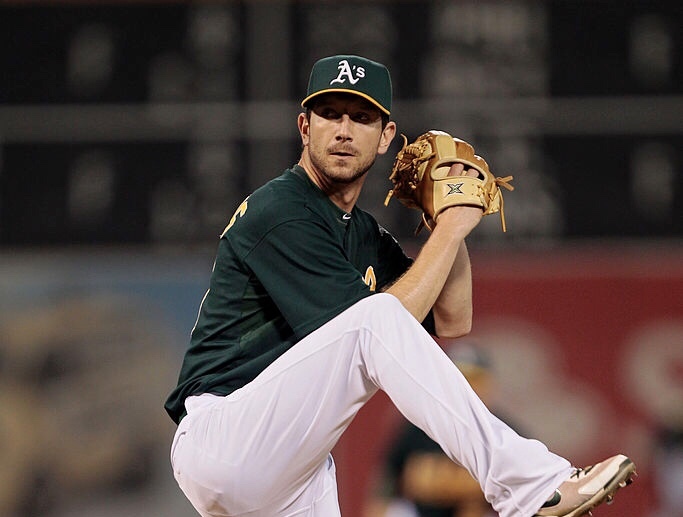 The A’s dealt the left-hander to the Washington Nationals on December 11, 2013, and Blevins went on to pitch to a 4.87 ERA, 1.24 WHIP, 2.77 FIP, 0.47 HR/9, and 10.36 K/9 in ’14. He had an incredibly unlucky season, as his FIP indicates that his ERA should’ve been under 3.00, and most certainly not the ugly 4.87. Blevins was traded to the Mets just days before 2015 Opening Day, and missed almost the entire season with a distal radius fracture of his throwing arm. He went back to full-time action in the coming seasons though, and once again pitched well. Blevins boasted a 2.79 ERA and 3.05 FIP over 73 games in 2016, and then a 2.94 ERA and 3.12 FIP in ’17. After two terrific seasons in New York, Blevins earned himself a $7 million contract from the Mets for 2018. Unfortunately, he underperformed heavily. The 35-year-old reliever finished the year with a 4.85 ERA, 1.36 WHIP, 4.97 FIP, 4.64 BB/9, 1.27 HR/9, and a remarkably low 21.8 GB%. Unlike his 2014 season in which his 4.87 ERA was a false representation of his performance, that wasn’t the case for Blevins last season. It was a very uncharacteristic season for him, and could possibly be the start of his career’s final phase. However, one bad season doesn’t mean he’ll automatically pitch poorly in 2019. He’ll be returning to Oakland, where he’s pitched well, and could return to his past form by going back to the Athletics. He now joins Ryan Buchter in the A’s ‘pen as the two left-handed relievers for Oakland.